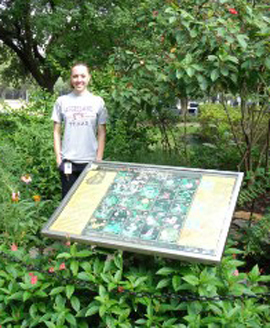 Laura Adian, an intern in our Cockrell Butterfly Center, is a guest blogger for us today. Join us as she writes about her summer internship and what tasks she does for the museum, maintaining the butterfly center and the greenhouses. Howdy! 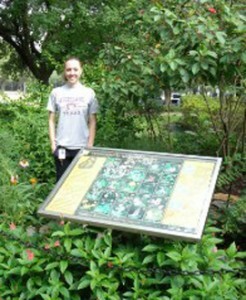 My name is Laura Adian and I am one of the horticultural summer interns at the Cockrell Butterfly Center. 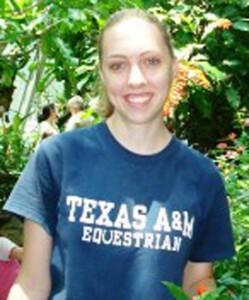 I am a senior Horticulture major, minoring in Business, at Texas A&M University. Although I am interested in all areas of horticultute, my specialization is fruit and vegetable production. I wanted to give you a quick insight into my daily job here, as well as the day to day happenings in our butterfly center, so here it goes. On Mondays and Tuesdays, I work in the main conservatory. One of the most important things I do on these days is what we call “open” the Butterfly Center. This involves sweeping the leaf debris from all of the pathways and stairs, watering and raking the plant beds, putting out the amino solution and rotten fruit for the butterflies, feeding the iguana, and turning on the waterfall. Basically we just want to make the place look great for the public. After opening, there is always deadheading (pulling the dying blossoms off of a flower) and pruning to be done. This has to be done every week to encourage more flowering and to keep the plants looking their best. Fertilizing some of the flowering plants and orchids is another task that must be done on a regular basis in order to ensure maximum healthy growth. For the rest of the week, I work in the greenhouses and in the Demonstration garden. Up in the greenhouses, we raise butterflies and plants. Greenhouse #1 is where we do most of the propagating and repotting of the plants. 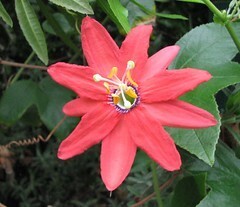 Greenhouse #2 is filled with 800 plants, mostly Passiflora, that we use as host plants for the butterflies. This is also where we do recovery of the plants, after the caterpillars munch all the leaves off them. Greenhouse #3 contains the insectaries and pupation cages full of butterflies and caterpillars. Every week, the host plants in the insectaries that are full of eggs are transferred to the pupation area. Then, we put fresh host plants and nectar sources (from Greenhouse #2) into the insectaries. In the pupation area, the hungry caterpillars must always be fed, which means transferring them from the already eaten, leafless plants to fresh plants that we bring from Greenhouse #2. Afterwards, we take the eaten plants to the recovery table in Greenhouse #2. This is the never-ending cycle of raising all the beautiful butterflies. One of the bigger projects we had to do this summer was to re-tie and re-moss all of the orchids in the conservatory. The orchids are scattered throughout the conservatory on trees and poles and they must be rewrapped every year in order to keep their roots from drying out and to keep them looking nice. That was quite a task because there are dozens of orchids and every time you think you’re done, another one seems to pop up. In the next week or so, we will be putting half a semi-truck load of soil into all of the beds in the conservatory. 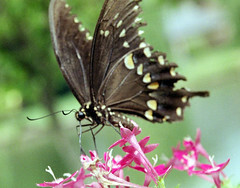 We will also be planting 100 red and pink Pentas to ensure fresh nectar sources for the butterflies. This is obviously a big undertaking but it must be done every summer and I can’t wait to see how good the conservatory looks after we’re done. We also have to water in the greenhouses every day and fertilize all the plants regularly. Then, of course, there is the general maintenance of the greenhouses, which seems to be an ongoing project. In the Demonstration garden, we are planting many new nectar sources and host plants for the butterflies to come check out. Since I’ve been here we’ve planted Pentas, Pink Turk’s Cap, Asters, Milkweed, Lantana, Celosia, Passion vines, Dutchmans’ Pipevine, and many more. Right now, we are in the process of planting Dwarf Mondo grass in between the cracks of all the stones. We have already planted 7 flats and will plant 10 more in the weeks to come. In the next few weeks, we will also add a bench and some other focal areas. Again, watering and fertilizing must be done on a regular basis. The Demonstration garden is one of my favorite projects and it looks fantastic. We also maintain the plant cart in the Grand Hall of the museum. We price plants from the greenhouse and bring them down to the plant cart to sell. We sell nectar sources and host plants such as Salvia, Pentas, Lantana, Passion vines, and Durantas. We have to sweep the plant cart, water the plants, switch out plants, and fill the brochure holder on a daily basis. For the Fourth of July weekend we even did a red, white, and blue theme. I have even been fortunate enough to get to go on fieldtrips to some great nurseries this summer. We have been to Treesearch Farms, Hines Nursery, Nelson Water Gardens, and Cornelius Nurseries. We are also planning on going to Mercer Arboretum later this summer. None of this would be possible if not for the great staff at the Butterfly Center and their desire for us to have an awesome experience this summer and to see all that we can in our 10 week stay. That is basically my summer in a nutshell. I really couldn’t have asked for a better internship or better people to work with this summer. I have learned so much about butterfly rearing and all that it takes to run a huge operation like the Cockrell Butterfly Center. More importantly, I have met some amazing people who are top in their fields, always willing to lend a hand, and really passionate about their work. My experience this summer would not be nearly the same without them.